InPrint is the major event for the industrial print technology sector. This is the place to showcase high-level expertise, cutting-edge technology, product launches and numerous industrial print solutions. The wide range of industrial functional and decorative printing on display includes screen, digital, specialty, inkjet and 3D technologies. The event will be held from November 20 to 22 2018 at Milan, Italy, at the MiCo center. InPrint Italy 2018 directly meets the needs of specialists looking for customized industrial print solutions to generate new market opportunities and revenue. 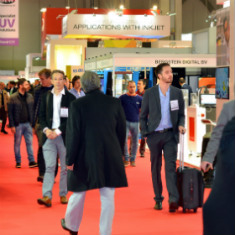 The three-day exhibition is supported by an extensive seminar and conference program of over 60 sessions, many of them examining future developments in the industry. Leading experts will share their knowledge and insights in three key areas – functional, decorative and packaging printing, focusing on Inkjet printing and applications.